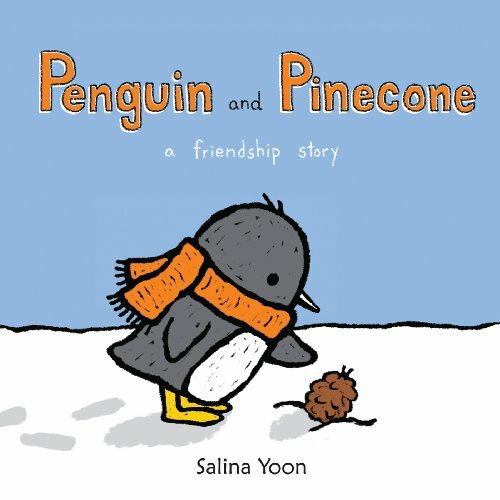 This little penguin is the cute and incredibly endearing character of Salina Yoon’s picture book Penguin and Pinecone. Penguin and Pinecone opens with those beautifully simplistic illustrations. Crisp black lines, vivid colours … and did I mention that penguin? When Penguin discovers a ‘curious object’ (better know to you and I as a pinecone) he decides to befriend it and do whatever it takes to make his friend happy, because really it is far too cold for pinecone to survive in such icy conditions. Yoon’s well thought out tale has a beautiful ending with a simple message about love and friendship, that’s sure to generate a bit of discussion. Penguin and Pinecone is such an adorable tale about friendship, set against snowy climes it may well fall into the Christmas pile for those whose Christmas comes during the winter.